LONDON, England (CNN) -- The UK now has the third highest number of cases worldwide, after the U.S. and Mexico, according from the British government data. Hundreds of thoussands of government information leaflets have been delivered to UK homes. Lab tests show that there were 9,718 confirmed cases of the virus in the UK, a figure that's just behind Mexico, which had 10,262 cases as of Wednesday. The U.S. currently has the highest number with 33,902 lab-confirmed cases, according to latest figures from the World Health Organization. Across the world there have been 94,512 cases of swine flu since it was first reported in Mexico in April with 429 deaths, WHO figures show. Fourteen patients are now thought to have died in the UK after contracting swine flu, the country's Health Protection Agency reported. The number of deaths in the UK has risen dramatically since Tuesday when seven people were known to have died from the H1N1 virus. A week ago, the total was four. However, not all the people who have died of swine flu, died as direct result of the virus. All patients had underlying health problems, Britain's Chief Medical Officer Sir Liam Donaldson said. An estimated 8,000 people are thought to have contracted the disease in Britain in the last week, from around 27,000 who called their doctor complaining of the flu, newly released National Health Service (NHS) figures show. 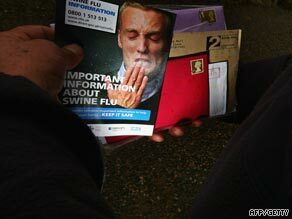 There are currently 335 people in hospital in England with swine flu, of whom 43 are in critical care, the NHS said. Figures for the rates per 100,000 people in the UK showed children aged between five and 14 were among the worst affected by swine flu, followed by those aged one to four. But the true scale of numbers affected in Britain could remain unknown as the figures did not take into account those treating themselves at home. Donaldson was reported by the UK's Press Association as saying: "We know something about the people seeking help from the NHS but there will be many other people who look after themselves or don't realize they have it and don't show up." He added: "We have to acknowledge the problem is bigger than surveillance is showing us. "That will always be the case, it would be the case with seasonal flu or anything else." Last week, health secretary Andy Burnham warned that by the end of August, around 100,000 people will be affected with the virus every single day. He moved the country on to treatment mode, which means people with flu symptoms will be encouraged to quarantine themselves at home and get a friend to pick up anti-viral drugs for them. The first batches of vaccine are expected to arrive in the UK by late August, according to the NHS. It says 30 million double doses -- enough for half the population -- are expected to be available by the end of the year. "The government has ordered enough vaccine for the whole population and, when it becomes available, will focus on those at the greatest risk first," the NHS reports on it's Web site.